I recently took a 6 week Love & Logic parenting class. Our city's public school system did it for free (which warms my cheap, penny-pinching heart) and I went with a couple friends who have similarly aged kids. It gave me some desperately needed skills for dealing with Stinky's recent brush with the terrible twos and things have been running much more smoothly around here lately. 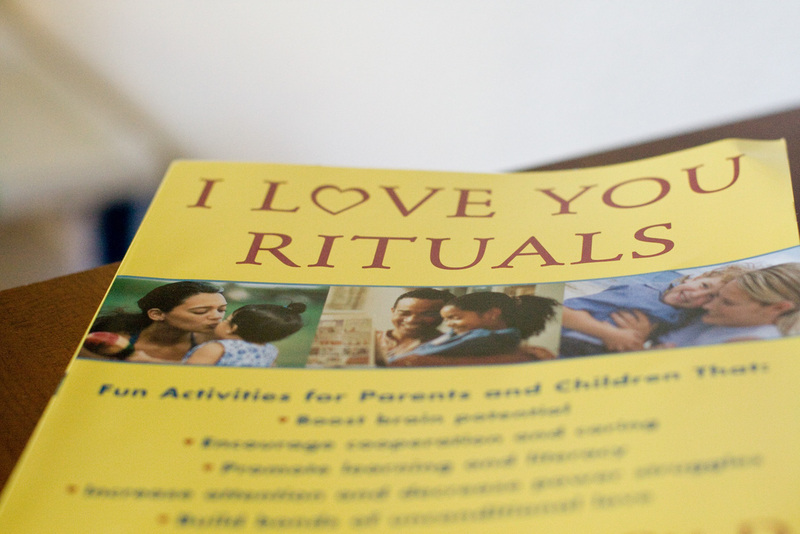 Our instructor heartily recommended I Love You Rituals by Becky Bailey as a complement to Love & Logic. I had a gift card to Barnes and Noble so, rather than get it from the library like I would normally do, I just bought it. I hoped it would be the kind of book I'd like to keep on hand for quick reference when I needed it. Thus far it has not disappointed. As I read through the rhymes and games I knew Stinky would love them all. She gives specific ideas for things you can do with your child but also gives ideas for creating your own. I've used several of her rituals over the past few weeks and have come up with a couple of my own. Our mornings are much more pleasant when I start them with a loving ritual instead of not very nicely asking Stinky to go back to bed because it's freaking 6 in the morning. We have weathered several pre-naptime tantrums with the help of her sweet revised nursery rhymes. Some of the games and rhymes seemed silly to me as I was reading them but they work when done with a 2 1/2 year old. If you have younger children this is a great book for helping you bond and build trust and all those other lovely happy things you want in your relationship with your babies.